Athens, Ga. – The University of Georgia Veterinary Teaching Hospital now has iPro continuous glucose monitoring devices available for cats and dogs with diabetes mellitus. The devices, commonly used for human patients with diabetes, are used to gather data on the patient’s response to insulin. According to the State of Pet Health Report 2012 released by Banfield Pet Hospital, the prevalence of pet obesity has risen 37 percent for dogs and 90 percent for cats since 2007. Diabetes, a common result of obesity in pets as well as humans, is diagnosed in 42 percent of overweight dogs and 40 percent of overweight cats. Signs of diabetes in dogs or cats include animals that drink, urinate, eat and sleep more. They also will show signs of tiredness and have a decreased exercise tolerance. “Diabetes is a big problem in animals,” said Ward, who also serves on the UGA Obesity Initiative, a collaborative effort among colleges at UGA to raise awareness and research solutions to the ongoing health issues that typically occur with obesity. The iPro continuous glucose monitoring device features a small disposable sensor, about the size of a paper clip. One end of the sensor is inserted under the animal’s skin to read blood glucose levels. Once the sensor is in place, a small recorder about the size of a quarter is plugged into the other end of the sensor to collect data. To ensure the device stays in place and the pet does not bother it, a snug garment is put on the animal. After the system is equilibrated, the device records blood glucose readings every five minutes. Three to five days after the sensor and recorder are put in place, they are removed and mailed to the veterinary teaching hospital. The sensor is discarded, and the recorder is plugged into a computer where the data is downloaded and analyzed. UGA veterinarians evaluate insulin levels and recommend changes, if necessary, in medication levels. With the devices, animals do not need to have blood drawn every two hours, and owners can keep their pets at home. The sensor causes very little discomfort when placed, Ward said, and animals do not need to be sedated, which is sometimes the case if blood must be drawn. The biggest benefit is the information collected is more accurate with the monitor than with a standard blood test drawn every two hours. When blood is drawn repeatedly in a veterinary hospital setting, dogs and cats can get agitated, which can artificially increase glucose levels. 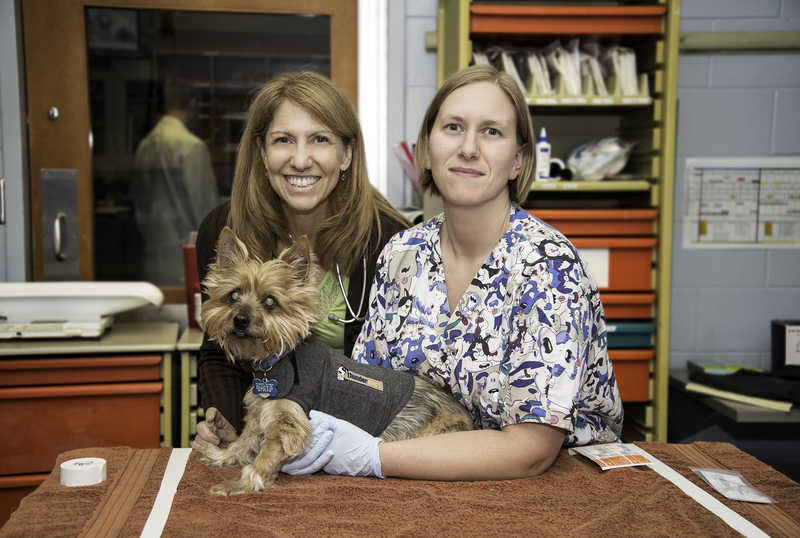 Murphy Hansen, a silky terrier who was diagnosed with diabetes five years ago, was outfitted with one of the devices to provide information about his blood glucose levels since he gets insulin shots three times a day. Pet owners are still responsible for keeping a log of food intake, insulin shots and exercise during the time the pet has the iPro. At least two glucose blood tests should be collected each day. Animal owners interested in learning more about continuous glucose monitoring should contact the teaching hospital through a referral from their family veterinarian. Animals will need to visit the teaching hospital to have the chip inserted. UGA faculty will analyze the resulting data and then can work with the referring veterinarian to manage diabetes treatment. The College of Veterinary Medicine, founded in 1946 at UGA, is dedicated to training future veterinarians, conducting research related to animal and human diseases and providing veterinary services for animals and their owners. Research efforts are aimed at enhancing the quality of life for animals and people, improving the productivity of poultry and livestock and preserving a healthy interface between wildlife and people in the environment they share. The college enrolls 102 students each fall out of more than 800 who apply. For more information, see www.vet.uga.edu. The current UGA College of Veterinary Medicine Teaching Hospital, built in 1979, serves more than 20,000 patients per year in one of the smallest teaching hospitals in the U.S. The college is currently working to raise $33 million toward building a new veterinary medical learning center, which will include a new teaching hospital as well as classrooms and laboratories that will allow for the education of more veterinarians. For more information, see www.vet.uga.edu/vmlc.